Here's a great big offer stack for you on gift sets at Boots. They have a clearance on selected luxury bathing gift sets so that they're now just £15 - £16 each, with contents worth as much as £49! That means super low prices on sets from Ted Baker, Sanctuary, Joules and Champneys, so I'm off to get my order in right now! There are four sets to choose from in this clearance, and all are great value for money. The Ted Baker Pause For A Pamper Gift Set* contains bathing and toiletry treats worth £40.22, and although it was already good value at its previous offer price of £20, it can now be yours for just £15! The Sanctuary Spa Indulgence Box* is on offer at just £16, and for contents worth £41.50 it's another super buy. 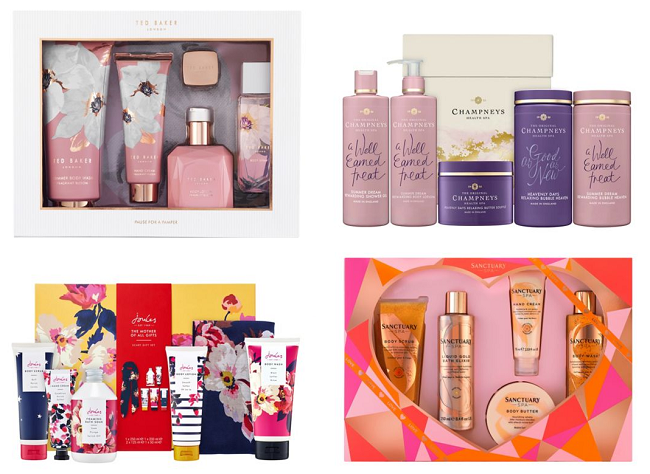 It's the Champneys Reward and Restore Gift* that I have my eye on, as it's packed with five luxurious bath time treats worth a whopping £49, but it's now down to £16! That's gone straight in my basket at that price. I'm also grabbing this Joules The Mother If All Gift Sets* was a special purchase at £20, but it's now dropped to just £15. As it includes five bath and body products, plus a beautiful Joules scarf it's a must-buy. These gift sets were originally on offer as part of Boots' Mother's Day gift range, so that's why they have been reduced again to daft low prices. The only one that mentions mum on the packaging is the Joules set though, so the rest will be fine for gifts for anyone.